How to take a decent photo for your fake id? For years we have been striving hard to perfect minute printing techniques, micro patterns and other important aspects of forgeries. All of this goes to vain if you do not provide a photo that fits the standards of a DMV issued license. Taking a photo for an ID can be tricky, we get that. That’s why we’ve compiled this short guide to make your life easier. Follow each step carefully and your order will not be rejected. 1) A digital camera with a flash and a high megapixel (a good camera) count. Scanned photos will not be accepted. You can even use an iPhone or Samsung high-resolution camera phones for it. 2) A well-lit room (do not stand near the ceiling bulbs). 3) The background of the photo does not matter. You can use any background in your photo and we will crop your body structure out of your image and then we will implant it onto our templates. 4) No jewelry. Neat hair (this is VERY important). 5) Wear clothes that contrast your skin tone (dark colors for fair skin, lighter colors for dark skin). 6) Smiling is ok for some states, but the real id act disallows you to use a laughing gesture in New Jersey State photos. So you can smile but do not laugh like an idiot and ask us to implant that worthless photo on our templates. When you’re taking your photo make sure that there are no shadows. This is best accomplished by following our instructions above. Follow it for reference on where to stand in relation to the rest of the room. Your picture makes the ID; if it is done poorly your ID will be confiscated. You can even visit stores like Walmart, 7-11, Target or more for a good photo. These stores provide a service where you can pose for a friendly photo and depicts the requirements needed for an identification card image. You can even select the background you want behind from blue to white or any color that you choose. We do not accept selfies as photos for your fake ids. This kind of photo is not intended for the use for identification and hence your ID will look fake in a first glance. Do not cover your face with your hair. Eyeglasses or sunglasses are prohibited while taking your photo. Failing to comply with these instructions will lessen the chances of acquiring a high-quality fake id. We try our best to replicate each element on your driver’s license but if your photo is not up to the standard then there is very little we can do with it. 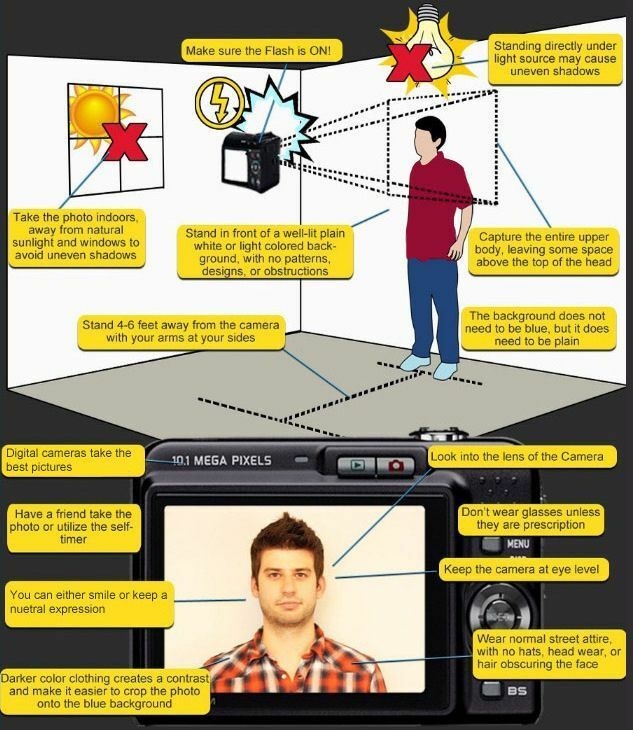 Read some more resources on How to take a proper photo for your Driver’s license.